Yesterday morning, around 7:30, I was awoken by Tucker barking, once, down in the laundry room, where he sleeps. I have been sick all week, with nights spent swinging between illness-induced, jolting-awake nightmares, insomnia, and mouse killings. When I heard Tucker bark again, a single bark, I swum to the surface in a daze. Then he barked again. In the two and a half years that we’ve lived together, I can count the times Tucker’s barked from his sleeping room on one hand. In fact, I have him sleep in the laundry room, instead of loose downstairs, because I believe it’s the only way he feels like he’s “off duty” and can relax from his job of relentlessly keeping tabs on everything. But this morning he was definitely telling me something, very clearly, and by that third bark I was already on my way downstairs. Ah, insomniac online shopping—looks like that horse I ordered had been delivered! All joking aside, I had a serious situation on my hands. These are my next door neighbor’s two horses, and they were loose. Again. On Monday morning I’d woken up and seen them grazing outside of their fence. By the time I’d made a call to determine my neighbor wasn’t home, these two horses were on a heel-kicking joy ride up the road. A horrible situation for all involved, particularly any unsuspecting drivers who might be on a collision course with two revved-up, slightly panicked, thousand-pound blindly running animals. I’d gotten dressed and run outside to try to get the horses back in, but they were out of sight by the time I made it across the pasture. I wandered the woods in the direction they’d gone, but no luck. I was just about home when another horse-owning neighbor came walking up the road, leading one of the horses with a rope gripped around its neck. The other horse followed behind. 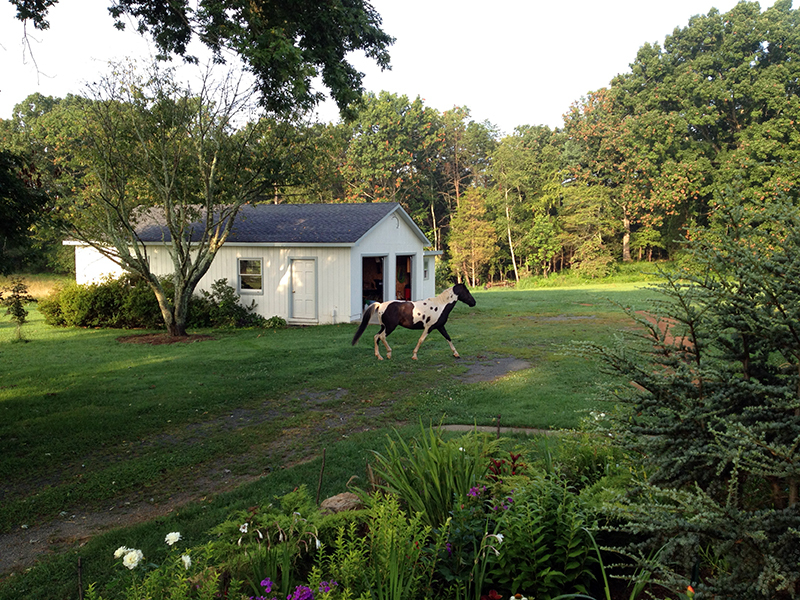 Apparently yet another neighbor had seen the horses on the road and called the neighbor who caught the horses, and they were back home safe for eight hours before their owner returned to question their chipped-up hooves and get the story. She said she’d been distracted and forgotten to fasten their gate the night before. 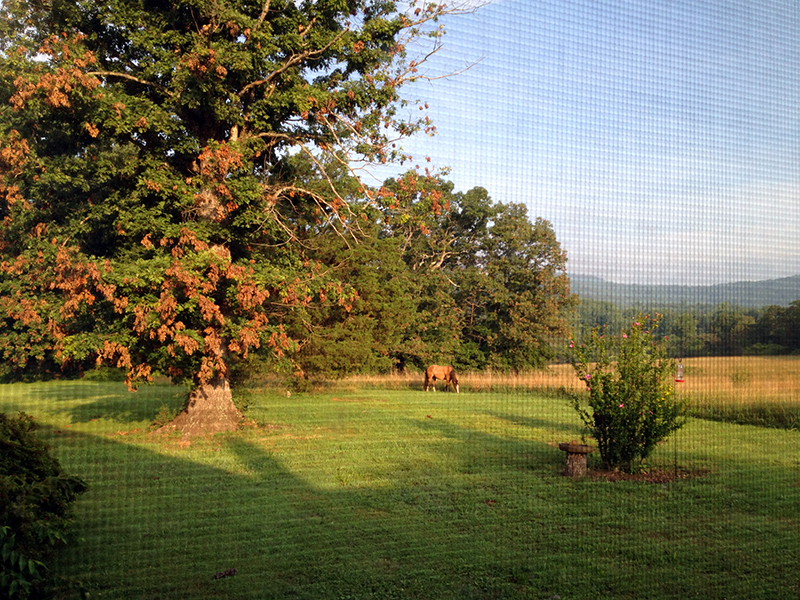 And now, here we were four mornings later with the same horses on the loose again. I left a message on my neighbor’s cell phone, and was calling Monday’s horse-catching neighbor when the horses’ owner returned my call. She came right home and with a whistle had her horses back in their pasture. She called to thank me, and again said she’d been distracted and left the gate open. Wow. In four years I have yet to see these horses get loose, and here they went twice in one week. The animal drama around here just doesn’t stop. But thanks to my farm dog, who wasn’t sleeping on the job, the horses were collected before traveling further afield or into the road. Tuck got an egg cooked in bacon grease on his breakfast, and lots of hugs for a job well done. I would LOVE to wake up and find two horses of my very own on my land – oh, wait a minute, I forgot – I no longer have any land! Unfortunately. The condo here will not even allow pets! The horses were lovely. Maybe, next time, you can keep them! You are currently reading Every little girl’s fantasy at Bonafide Farm.